Here is an image of the penny, maroon celluloid token from Valletta. Diameter 22 millimeters. Tramways operated on Malta from 1905 to 1929. To date this is the only known transport fare token from Malta. Photo courtesy of Bob Lyall, author of The Tokens and Checks of Malta, Warrington, 1999. The British influence is very clear and that even includes the colour of the penny. I am intrigued by the reference to lifts. Are there still public lifts on Malta? Do you still pay to use them? There are other Malta tokens - enough for a book on them, but they are not transport tokens. Macartney, McElroy & Co. Ltd. Started operating electric trams in Malta 1905. The trams' quarter century of operation was marked by vicissitudes as varied as the steep hills and the sharp curves on their route. Macartney, McElroy also operated the Baracca Lift, initially a minor adjunct to their Malta operation but subsequently invaluable in helping to pay off the tramway debts. Messrs. Joseph Richmond and Co. Limited of 30 Kirby Street, Hatton Garden, London, constructed and erected the Upper Barrakka Gardens lift for Macartney, McElroy & Co. Ltd. The lift was opened in September 1905. Macartney, McElroy & Co. Ltd. was an engineering company specializing in electric tramway systems. In fact Macartney, McElroy & Co. Ltd. had laid down tramlines in Malta in 1904. The tramlines linked the Three Cities and Rabat to Valletta, via Floriana, Hamrun, Birkirkara, Attard and Zebbug. Source See this for much more information and pictures. Another page of the above site shows the Maltese Public Transport since 1856. This service was inaugurated on February 23, 1905 by the Malta Tramways Limited. Trams linked Valletta with the Three Cities, Birkirkara and Zebbug. 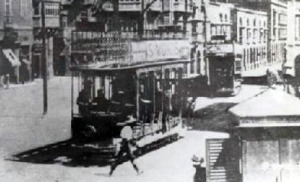 The Tram had two floors, the lower and the Upper Deck. On the first floor, where the operator [driver] used to be, it had ten reversible wooden seats, where 20 passengers could be seated. The rest, mostly farmers carrying their fresh fruit and vegetables, including live chickens and rabbits to be sold at Valletta market, would stand up. The upper floor (Upper Deck) could accommodate up to 18 sitting passengers. Standing passengers weren’t allowed on the upper deck due to the overhead electric wires. The Tram had no doors or windows, and the Upper Deck had no roof. The Malta Tramway service was terminated on 15th December 1929. This page makes very interesting reading. A page linking to the Coins of Malta showing the collection of John Gatt. This has links to other articles on coins of Malta and other collections. Are there still public lifts on Malta? Do you still pay to use them? At the lower station you just have to cross the road to get on the ferry to the Three Cities (Vittoriosa, Senglea and Cospicua) across the Grand Harbour. Very interesting. There are other lift tokens, but there are not so many lifts (and escalators) connecting streets and those I know are almost all free: Brussels, Monaco, Siena, a few places in Spain, there are probably more. This token may be one-of-a-kind. The one paying (with coins) exception I know of is in Rocamadour, but that's not a real lift (ascenseur), but rather a cable train (funiculaire). I have yet to find a free funicular. They need a driver, while lifts can be fully automatic. There are known lift/elevator tokens from Vienna, Rome and Mexico City. Those are the ones I recall. There may also be a few from the United States. Who needs a driver/operator? The Dubai Metro is driverless, and tokenless. There are numerous lift (hiss) tokens from Sweden - e.g. Katarinahissen and Mariahissen in Stockholm. Please note that I wrote about public lifts connecting streets and differentiated between lifts and cable trains. Here you use shanks pony!